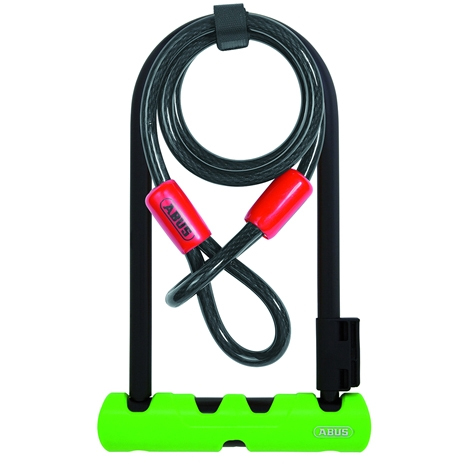 A great heavy duty lock and great to have the added cable too for extra security. Cable could be a little longer but otherwise it's perfect! This is a lot lighter and smaller than most Abus D locks, making it easier to transport however it was usually not quite large enough to go round both the bike frame, the front wheel and the post to which it was being attached. The cable was not quite long enough to go round both wheels. Was a bit skeptical about buying this product when it had no reviews. But I'd seen decent reviews for it on another page, and then found it here cheaper. The delivery was quick and the lock seems pretty sturdy! The extension cable is great for putting through the wheels (or round a larger pole/lamppost - although the cable security is much less than the D Lock's silver rating). Only issue is that the part that is supposed to fit on the bike frame to hold it when not in use doesn't seem to fit in my bike properly so I always have to put the lock back in my back. This is a bit annoying, but not the end of the world. Really pleased I found a lock that I feel safe using in London for such a great price! !